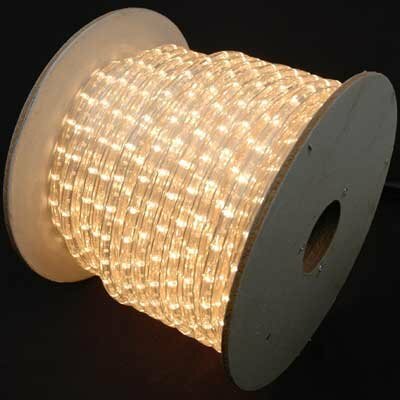 American Lighting RL-CL-150 Incandescent Rope Light Reels, Dimmable, 5.5-Watts and 8 Lumens per Foot, 120V, 1/2-Inch Diameter, 18-Inch Cut, 150-Foot, Clear. American Lightings economical reels come in a variety of colors, sizes and voltages! These original rope lights can be used for all kinds of decorative lighting applications, indoors and outdoors. They are cost-effective, bright, colorful, flexible and a versatile linear lighting product! Dimmable with most standard incandescent dimmers. UV resistant clear PVC housing with incandescent lamps spaced every 1-inch, vertical mount for RL and MRL and horizontal mount for CRL. Field cuttable every 18-inch (non-rated if cut) for maximum project flexibility. Each reel includes one pre-attached "conkit", four additional conkits and 50 mounting clips. Do not operate rope light while coiled on reel. Founded in 1989, American Lighting, Inc. manufactures a wide range of lighting solutions for your residential, commercial and specialty lighting needs. We pride ourselves in being a lighting solutions provider by offering our customers a broad line of innovative and high quality lighting products. Continued innovation is a core strategic initiative at American Lighting, and we are committed to developing new products by utilizing the latest lighting technologies and designs. We pledge to deliver superior customer service by employing and training a team of highly experienced lighting professionals.